When one hose won't do! 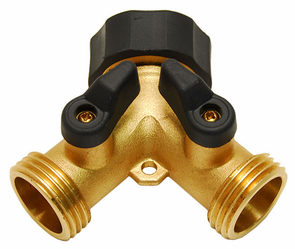 The Dual Brass Connector Shut Off Valve allows you to hook two hoses to one spigot. This valve splits the single outlet of your spigot into two separate outputs, each with their own own valve. You can run both hoses at once, with even flow form each, or shut one for maximum power. You can even close both to stop water flow all together. The Dual Brass Connector Shut Off Valve has extra large handles for easy grip when operating. The solid brass construction is extremely durable and can withstand hot water temperatures. An Easy-On swivel connector allows the Dual Brass Connector Shut Off Valve to rotate once attached, helping to prevent the hose from kinking.